Encounters Art Space launched its spin-off, Encounters-on-the-Road, as a business venture in 2015. Encounters’ Director, Miladys Parejo, used similar business principles to those of Encounters Art Space; namely to be distinctive, agile and continually able to re-create internal capabilities and comparative advantage. This required working with kindred spirits and co-creating inclusive art experiences in different parts of the World. Encounters-on-the-Road strives to bring innovation practices to enrich encounters between viewers, artists, galleries institutions and collectors. By 2017, Encounters-on-the-Road had shown work in the UK, South Korea and in Europe. Encounters-on-the-Road’s first major event was an exhibition in Busan, South Korea, sponsored by the International Development Bank when the works of three major artists from South America were exhibited. In her opening address to the International Development Bank Annual Conference Miladys Parejo said: “There is a common language in the works presented here: you can see it expressed in colours, forms, shapes, textures and in the diversity of the materials that are used. Without doubt, when different artistic traditions encounter each other there occurs a magical dialogue that overcomes any verbal or language barrier”. Also, during this visit, a collaborative art project between South Korea Gallery and Encounters-on-the-Road was signed. Currently, Encounters-on-the-Road is supporting a due diligence process with the Arario Museun Seoul, Jeju Island regarding the work of two Venezuelan artists that Encounters-on-the-Road represents. Opportunities have been found for many individual artists to exhibit their work. The work of Jonidel Mendoza was exhibited in the Kellie Miller Arts Gallery in Brighton. Many pieces from sculptor Rafael Berrio went directly from the 2015 Artists Open House to be shown at the Sussex Prairie Garden and photographs collection of his sculptures has been produced to promote his work to a wider audience. Two magnificent ceramic pieces by Noemi Marquez were one of the early works displayed in a new sculpture garden at Architectural Plants in West Sussex. Followed by Marion Brandis with her architectural Kemp Town Sphere. By October 2016 Encounters-on-the-Road’s featured the work of Gaudi Este at the first Carre Latin Show in Paris, where her bronze statues attracted much attention. 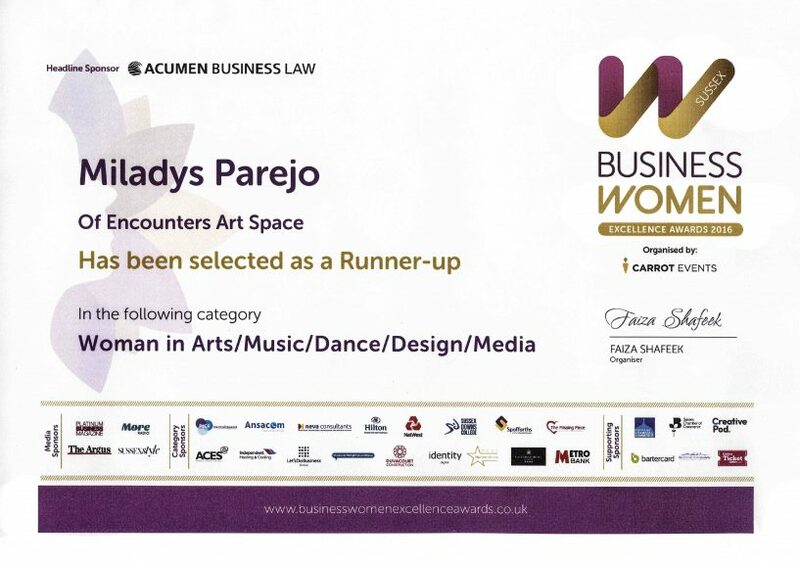 The achievements of Encounters were recognised when Miladys Parejo was awarded the prize of runner-up in the Southern Business Women of the Year competition for Art-Based businesses in 2016.